Many people are unaware that there are multiple types of whiteboards. Based on your use of the whiteboard and maybe even your profession, it is important to know the differences between marker boards. The boards vary in price and quality based on the material that is used to make them. The three main types of whiteboard materials are melamine, porcelain, and glass. Shop All Melamine, Porcelain & Glass Whiteboards Here! Which Whiteboard Is The Best? Choosing the best whiteboard for your home or office primarily comes down to just a few questions. Where will you be placing the whiteboard? What is A Melamine Whiteboard? Melamine is an economical and inexpensive laminate coating for whiteboards. The compound is made of cheaper material so the coatings on a whiteboard will wear down faster compared to a porcelain board. The wearing down of the melamine and the porous design will lead to ghosting of the markers. This can be fixed by cleaning and conditioning the board regularly. Whiteboards with a melamine finish are great when looking for a more affordable product. You may want to save some money by going melamine if you're using the board less frequently. What is A Porcelain Whiteboard? 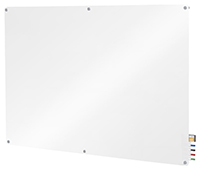 Our porcelain whiteboards are made of white ceramic and steel or have aluminum backing. Boards with steel backing are also magnetic. Ceramic is a durable material that is more resistant to damage such as stains, dents, and scratches. Porcelain markerboards feature longer lasting layers. This is great for heavy use because it requires less cleaning and markers are less likely to ghost. Installations of porcelain whiteboards are perfect in common rooms like factory floors and office lobbies. The only downside to this type of board is that is a little more costly, but the lifespan is much more substantial to melamine. 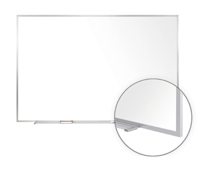 Whiteboards made of glass are extremely durable and are constructed from tempered glass for safety. The product will cost more than a melamine or porcelain board, but will not streak or ghost. Glass whiteboards are modern and come in many different colors, including clear. Our markerboards are available with many framing options or frameless if you prefer. If standoffs are included for wall mounting, they give the board a strong wall anchor. Some glass boards are magnetic for hanging documents, plans, and memos. Glass boards often feature rounded corners for safety. Many people accent the boards with a colored wall behind it for a brighter display. Floorstanding tempered glass whiteboards are also available in a few designs - both with wheels for easy transportation. These are great in offices or classrooms for group collaboration, presenting, or teaching. Our tables with whiteboard surfaces are often found in schools or offices for a creative way of jotting down notes or drawing. One of the best features of a glass surface is that you can use liquid chalk, dry erase & wet erase markers. If you have a modern office or workspace where a board would be used frequently a glass whiteboard is what you’re looking for. Buying products such as melamine sheets from your local store or Lexan (to have a glass whiteboard look) might look great at first, but after a while ghosting and streaking will begin to appear because of the lower quality material. This means that you can only keep notes and projects on the board for a small period of time before cleaning again. The cleaning of the boards will have to become more extensive. This will cost you more money for purchasing cleaning supplies, as well as costing you more time. We recommend going with one of our affordable whiteboard options. With different styles to fit any setting, we know you'll find one that's perfect for you!